After fighting each other for over a decade, the egg industry and the largest animal advocacy organization came to an agreement, one which will increase the welfare of egg-laying hens but also increase egg prices. The United Egg Producers, under persistent pressure from the Humane Society of the United States (HSUS), has agreed to transition hens out of battery cages and into enriched colony cages. The HSUS certainly believes the higher welfare standards are worth the increase in egg prices, but do consumers agree? My research says that when consumers are informed about the issue, yes, they applaud the move—even when they know higher egg prices will follow. Most consumers do not wish to see farm animals crammed into small cages, but if they take the time to discover the source of their pork and eggs, these cramped animal cages are what they will see. Chickens raised for egg production are placed in groups of 4-6 birds and raised their entire lives inside a cage so small that they cannot turn around without bumping into another chicken. Spreading their wings is out of the question. Sows (female hogs used for breeding) are confined even tighter, spending most of their lives in a stall so small the sow cannot even turn around. There are more farm animal welfare issues than just space allotments. Both layers and sows desire to forage for food, scratch or dig, socialize, and find comfortable places to rest. All of these “behavioral” needs are neglected in the typical egg and pork production facility. By transitioning from battery cages to enriched colony cages, the egg industry goes a long way towards meeting these space and behavioral needs. Why are animal cages used in the first place, when the average person finds them disturbing? In the competitive marketplace for food, farmers must employ confined production facilities to keep their costs low, because consumers generally emphasize low prices over animal welfare at the grocery store. Yet, at the same time, consumers who purchase food from so-called “factory farms” donate money to the HSUS, who uses some of this money to ban the same animal cages used to produce most eggs and pork. In surveys, referendums, and economic research, consumers consistently support the banning of the same cramped animal cages used to produce the food they purchase. One reason the farm animal welfare debate cannot be quickly resolved is that consumers have difficulty resolving the issue for themselves. They want livestock to be treated kindly, but they also want low food prices, and it is difficult to reconcile the tradeoff between animal well-being and food prices in the grocery store and/or in referendums. For these reasons, the farm animal welfare debate is a messy, contradictory debate—the trademark of a democratic process. Although consumer attitudes can be elusive to identify, research has revealed a few facts. The most important fact to stem from consumer research is that, when consumers are informed about how layers and sows are raised, they consistently state they are willing to pay the higher food prices that would result from better animal care. This does not imply that regular grocery store shoppers will reflect this level of concern in their willingness-to-pay for food, because the regular grocery store shopper is uninformed. However, the farm animal welfare debate is largely a policy debate. Should we ban colony cages for layers? Should we ban gestation stalls for sows? It would seem prudent to base policy on the opinions of informed consumers, as opposed to uninformed consumers. When employing this prudent procedure, there is little doubt that the ban on cramped animal cages occurring in the European Union and US states is justified, and should be stretched across the map of industrialized countries. Although the United Egg Producers rarely hear from informed consumers, I can tell them from my research that these consumers offer them many adulations for adopting enriched colony cages. For the producers sake, let’s hope uninformed consumers in the grocery store share some of this enthusiasm. F. Bailey Norwood is Associate Professor in the Department of Agricultural Economics, Oklahoma State University, and Jayson L. Lusk is Professor and Willard Sparks Endowed Chair, Department of Agricultural Economics, Oklahoma State University. 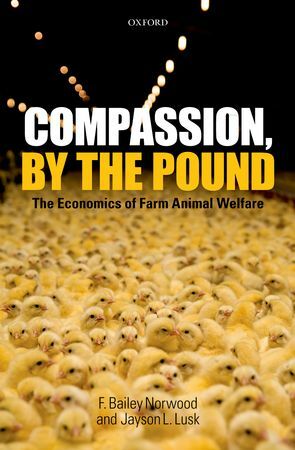 They are the authors of Compassion, by the Pound: The economics of farm animal welfare.